When using lombok with intellij, there is a great lombok plugin that enable Intellij to pick up the getter setter methods within the editor. However, when trying to build within Intellij, the build will fail. 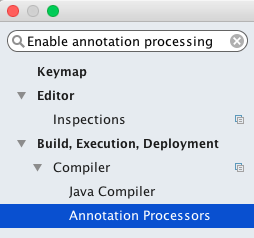 To solve this, we only need to configure Intellij to process the annotations. Go to Settings and type in "Enable annotation processing" in the search field and click "Annotation Processors" in the result. Then just check "Enable annotation processing"
No Comment to " Unable to build in intellij idea when using lombok "